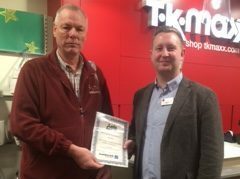 Following an audit of its Southampton branch, TK Maxx was today presented it’s Let’s Loop certificate by Lets Loop founder and Healthwatch Southampton Strategic Group member Steve Beal. Lets Loop Southampton. © Copyright 2018. All Rights Reserved.